I "want" to run five out door lights, 6 indoor lights and 3-4 electrical outlets. All will have switches so I won't be running all at the same time by any means. I only use the cabin for hunting on the weekends, am getting a wood stove and is well insulated. Any thoughts on how many solar panels and of what voltage I would need. Thanks for the helpful website. Saw what you used, but unsure how to install. Any helpful sites or posts on install/setup? To get reasonably accurate answer, you would have to calculate the total required wattage vs. battery capacity vs. solar panel specs and how fast you need it to be re-charged. For example, a typical car battery is 70A/hr. That's @ 12V = 840W/hr --- i.e. a brand new, fully charged battery can (theoretically) power one 100W light bulb for 8.4 hrs. ~3 such batteries (or equivalent), with 30W solar panel and a 7A charge controller. That's assuming fairly conservative usage, and several days to recharge. You can use modest light bulbs, 15-40W 12V (there is an ample choice from the auto stores). If you want 110V power or bulbs, you will need an additional inverter. Thanks Cabinbuilder!!! Do you have any good sites/recommendations on how to build my own? I saw and understand the basic components as listed on your website, but am not quite sure how to connect the dots. 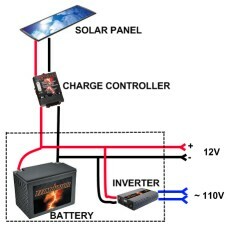 Usually, solar system components (solar panel, charge controller, inverter) come with the diagram on how to connect them. Do you have any good sites/recommendations on how to build my own? I saw and understand the basic components as listed on your website, but am not quite sure how to connect the dots. On the site you have that you used the 1500 power pack with built-in inverter. What's the difference in using this versus buying a separate battery and inverter and is the power pack better...seems like it keeps everything contained well and is maybe a simpler option and if so something I would like to consider. I've got all my wiring done with the help of a friend. We have four outdoor lights, five indoor lights (all lights are 60 watts bulb rated but can also considering using fluorescentl lights), and five wall receptacles (two are outside). All lights have separate switches. Not that good with "power" so am still trying to find out what I need. As long as I keep my solar system below $1000 I will be happy. Is a 80 watt solar panel too much, or necessary or should I go with something smaller? I want 4-8 hours of use (which will probably be maybe one wall outlet for a radio for 3 hours and 3-4 hours of light (maybe 3 lights on at a time) per day. We'll probably use at most two days out of week and will only be a weekend cabin. No fridge, AC or any other electric use other than basic lighting will be needed. You're asking a lot of questions, so I'm going to do my best to help. The difference between a power box and a separate battery/charger/inverter/and power panel is mostly in convenience. To assemble the separate components takes time and a certain level of education. Miss wiring can be dangerous, as can any lack of proper safety features like fuses and disconnect switches. The power box does it all for you, in a safe way, but at a cost premium. The choice is yours. Now to your question of sizing. Now, for my area, we average 2.2 hours a day of "Full sun" which means I would need a 400 watt rated panel for this load. At an average cost of $5 a watt, this comes to $2000. Since it sounds like you're house is already wired for 110V ac, you'll need at least a 200 watt inverter. Use a good full sign wave, and that adds about $200, you can save this all by going full 12v DC. 12V CFLs are available. Finally, you'll want to have enough battery power to smooth out your needs for a week. Each golf cart battery is good for about 500 watt hours of useful charge, so 780 watt hours a day, 7 days a week, divided by 500 watt hours of capacity, means you need 12 batteries (round up to the nearest pair) at about $70 each, so another $800. Using CFLs can drop your power needs significantly (15 watts (60 watt equivalent) *3, 4 hours, 45 watts, 180 watt hours, 110 watt panel, $600 for the panel, 4 golf cycle batteries, $240 for the batteries). have you folks ever used the helpful information of homepower.com ? Thank you for the web site to refresh my desires. Scrimshaw may fine a mixed system could work for him site. A generator for heavy loads and a solar system for lights and the like. If he got a non-gasoline generator he could use the "gas" for heating and cooking. Minimunizing eviromantal impact is the trick. I could see starting with less than prefect and adding as funds make it possible to move over to other technologes saling off the then used equipment. We have been trying to live a sustainable lifestyle. We use two solar panels and live in a 500 square cottage. our lightbulbs are led. We install our own solar system. feel free to check us out. I run with LED bulbs, and some CFL's, remember CFL,s may last a long time and not use a lot of power but they can cause strange power problems in very cold climates, I sit at about 10,000ft, they can be very slow to "brighten up" when cold and while warming up they use more than the wattage rated at, where as the LED's are instant on. I would suggest useing CFL indoors only to keep them "room temp". The one in my storage building died after one winter, but it got down to -52'f in there. If you have heavy snowfall or overcast almost all winter you will not be able to charge your batteries with just solar if you use them at the "same time",they will need, I found, at least a week to charge in good weather in the winter. So I found a little jenny that works AWSOME, its a Honda EU1000i, it has a 12vdc output and can power one of those small dirt devil vacuums so I know it can power anything else I have too. Some great advice i've gotten for setting up my electrics came from the people at http://www.backwoodssolar.com/ . Not only will they try to answer you asap, but they will try to help you design your entire system for you with "live" help, and they aslo run off of solar power so they talk from experience not just theory. P.S. I plan on retireing my bigger jenny, an EU3000 soon and replacing it with a propane fueled one, quieter, cheaper, longer run time. I tried out my friends, ranit for 25 hrs on a 100lb bottle, ran like a champ. You might consider propane for a gen-set instead of gas if you go with Blue's suggestion. P.S. I plan on retireing my bigger jenny, an EU3000 soon and replacing it with a propane fueled one, quieter, cheaper, longer run time. I have a 100 sq foot cabin and I am looking to install about two lights indoors and 2 outside as well as an outlet or two for occasion use. Any suggestions? I have a 12 volt pump 3 leed lights , a small radio and 1, 23 watt, cfb ! You can get by with a lot less solar eqpt & batteries if you use LED lighting. I'm running 3x "35W equivalent" LED bulbs at total watts=12w. And the light (if you choose 3000K) is nicer than Fluorescent (CFL). CFL have problems starting up in the cold. A 70 AH battery would run 12w of lights for 70 hours. and then as expected 840Wh / 12W = 70 hours. There is an excellent PV sizing calculator here. Its a dynamic spreadsheet (MS Excel or OpenOffice required) that allows you to play around with all the important solar power variables. By fiddling around with it you can get a handle on what equipment you will need to set up a PV system that fulfills your requirements. For example, if I estimate that I'll need 300Wh/day with a three day backup, based on 3.5 hrs of usable sunlight per day, I can use 1 SV 190W panel ($254 from sunelec.com) and 2 6V Tempest TD255 batteries (225Ah ea, $186.00) If I increase the watt hours required, or increase my backup storage, the calc will automatically bump up the number of required components. I like to keep the calc open on one side of my screen while I internet-hunt battery and panel deals. Found a cheap 135W panel? Plug its stats into the calc and it shows you how many you'll need. Planning to add a DC fridge? Add the DC watt hours required and see how that affects your system. Its a great tool for figuring out just the right size system for your cabin. You folks with off grid cabins can also have mini solar backup lighting, What i did for my home ,I went to the local store, most Lowes ,home depot,walmart, target,stores cary the 3 light set for about $29.I picked up 5 sets,(3 sets for inside and 2 sets for outside,Each kit comes self contained, each light has a 20 foot cord, I mounted all on the sunny side of my home ran the cords into the different rooms and around the yard, Every night my home is lit up like a christmass tree inside and out.Once a year i replace the rechargable batteries.(p.s. )each kit also has a shut off switch so you can turn off the lights you don't want on. I leave mine on 24-7. I'm not afraid of the dark,but i hate falling at any time.the lights go off by them selves at dawn. Get a couple of strings of LED white Christmas lights when they go on sale after Christmas.. If they have a wall wart transformer, cut it off and wire direct to battery. They produce an amazing amount of light! Read the specifications on the wall wart. The only lights that can run on a 12v battery are those where the wart is converting 120 Volts AC to 12vDC. A lot of LED Systems convert 120VAC to 5 VDC, you cannot use a 5v LED on a 12vDC system. You can rewire a string to run on any voltage you want. It's a lot of work though and I wonder if it's worth the effort. We use several strings of std 120 VAC white LED xmas lights for outdoor lighting from one end of the cabin to the shed. They provide nice light and there's no fuss or bother. Do a search on battery xmas LED or converting xmas LEd to battery. Lots of info on rewiring along with some caveats about rewiring for low voltage. I'm happy to hear someone else say what I think. Agreed, Christmas Lights provide an amazing amount of light. 7 strings of 35 lights each (total 245 lights) is plenty for our cabin. Got them on sale for $2/string connected end to end. Each string uses 2 watts, wich amounts to a whopping 14 watts to light the whole cabin with a nice uniform glow which also happens to be very flattering. I recommend the warm or soft white. Hi there, i am currently designing a park bench for my end of school project, and im going to be implementing a solar system. Anyway, its going to be powering about 20 LED bulbs (from one of those led strip lighting sort of things) was wondering what sort of batteries and solar pannels i shoud be going for? i'm surprised nobody has mentioned the harbor freight solar panal kits. i have 3 kits totaling 9 panels, 15 watts per panel for a total of 135 watts. 30 amp sunforce charge controller, 2-6volt golfcart batteries wired together for 12volts. into a 750 amp inverter. this runs 2 lamps with 10 watt ,gives light equal to 75 watt each, the curly screwin kind. and the tv for 3-5 hrs per night. just got a new 2000 watt inverter and adding 2 more 6volt batteries, so we can run the freezer. i would think this set up would run you hunting camp. very easy to set up. if you need more specific info let me know. if i could get you some pics, they speak 1000 words! with 4 batteries and 9 panels this would put you around 1060, can't get it anybetter than that! I'm surprised only one person mentioned sunelec.com . You can't beat their prices for solar and they have some nice off-grid systems ranging from 400w to as large as you could want. I noticed that there is a lot of info in the above replys that is should we say less then accurate. A better place for asking questions or learning would be builditsolar.com or otherpower.com . Rather than leave us all in suspense, kenl , would you care to discuss what you are critical of? As for sunelec, everything is mostly fine I suppose. But I know a person who had a bad experience with them, including advice that certain items would work well together, when in reality they would not. Do a search for sun electric miami complaints, or something. Add to that, sometimes the panels they sell are not UL or ETL approved. For many folks that won't matter, but if there is an electrical inspection.... too bad. And the fact that it is or is not approved is not always easy to find. Was that way in the past at least. Well based on your post SCRIMSHAW all that you really need is a small solar array and a small battery bank. From your 'needs' you could easily get away with a small 200 watt solar panel array. Depending on how long you run the lights for (the longer you run them the more power you need to recharge the batteries) you could easily do a 125watt panel and 2 or 3 automotive batteries. With that panel you would need a solar charge controller. Then you can wire your batteries in parallel, build a small box for them that is vented to the outside (charging batteries produces Hydrogen and Pure Oxygen). Wiring is pretty simple. If you're going to be using high powered flood lights you're going to need more than 125watts of panels, if you're located up north you will also need to increase the size of your solar array due to the tilt of the earths surface compared to the path of the sun across the sky. If you're going to be using flood lights you're going to need around 300watts worth of panels so that you can fully recharge your batteries during the day light hours. I have 2- 30 watt ( 60 watt) solar panels. (power rating up to 30 watts and 2 amps@15 volt) I have 2 - 7 amp solar charge controller.1 - 1000 watts inverter and 2 marine deep cycle batteries 115 a/hr. I know how to install this kit. My question is would this be good to run 5 light bulbs (low wattage 15 W/ 60 W) 1 living room 1 kitchen 2 bedrooms and one bathroom. All the lights will not be on all the time (example- bedrooms bath maybe total of 30 min /night) kitchen 2-4 hours during week ends and living room very rare. 2 wall plugs. This is at my cottage. Ami on the wright track for now? YES !! !I HAVE HAD A 15 WATT SYSTEM UP AND RUNNING FOR THE LAST 5 YEARS WORKS GREAT IT RUNS A FEW LIGHTS AND THE WATER PUMP .